Pat Hodapp, director of the Santa Fe Public Library, was awarded Best First Book in New Mexico and Arizona at the New Mexico Book Coop Awards in November and also Best Cover Design for her travel book, The Complete Bucket List 100 Things to do in Santa Fe Before You Die. (2016, Rio Grande Books). Over 800 books were entered in the contest. 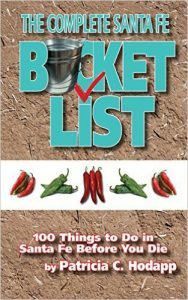 The Bucket List for Santa Fe held a first place spot on Amazon for several weeks in the category of Southwest Travel books. It even beat out Fodor for the top place in the category.